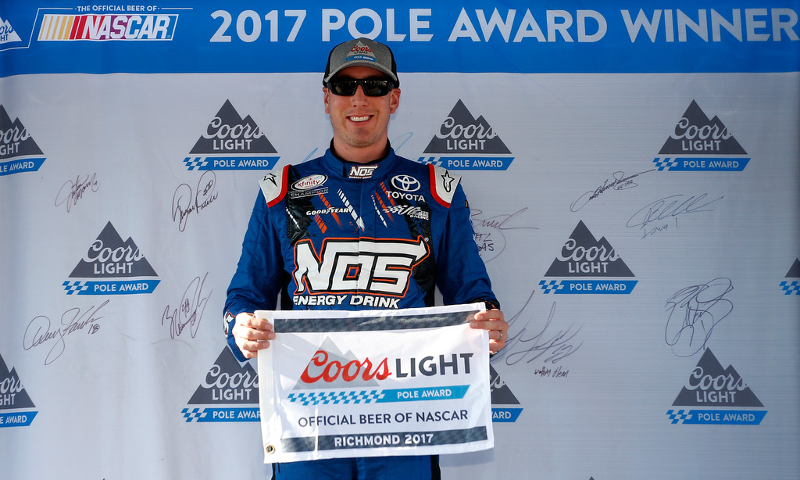 Kyle Busch scored his 64th career XFINITY pole Friday afternoon at Richmond Raceway (Brian Lawdermilk/Getty Images North America photo). RICHMOND, Va. — Friday night’s Virginia 529 College Savings 250 at Richmond Raceway marks Kyle Busch’s 10th-and-final XFINITY Series start of 2017. And one last chance to end the season a winner in NASCAR’s second-tier series got off to a great start Friday afternoon. Busch circled around the .75-mile track at 22.638 seconds (119.263 mph) for his 64th career XFINITY pole in his No. 18 NOS Energy Drink Toyota. Brennan Poole (118.828 mph) was the highest series regular in second, lining up alongside Busch’s Camry for later tonight. Poole qualified consistently in all three rounds before falling short in the final round to knock off the 2015 cup champ. Row 2 is full of Fords with Brad Keselowski (third) and Cole Custer (fourth). Friday night also features the final time both Keselowski and Kyle Busch fend off in an XFINITY race for 2017. Custer clinched a spot in the XFINITY playoffs last weekend at Darlington and is no stranger to victory lane at RR, scoring a K&N East win at the track in 2014. Dale Earnhardt Jr. (118.603 mph) completed the top-five while returning to the venue of his last NAScAR win-to-date in April 2016, coming in an XFINITY event. His future teammate and driver William Byron (118.52 mph) joins Earnhardt in the third row with a sixth-place qualifying effort in the No. 9 Axalta Chevrolet. Byron was the last car to go out in the final round before slotting in sixth for Friday night’s race. Blake Koch (118.369 mph) qualified seventh in the No. 11 LeafFilter Chevrolet as spring Richmond pole-sitter Daniel Hemric was eighth (118.312 mph). Those two series regulars were followed by another in Justin Allgaier (118.208 mph) while Cup interloper Paul Menard (118.074 mph) rounded out the top-10. The No. 42 team won the spring event at Richmond with Kyle Larson, but Tyler Reddick stepped behind the wheel of the machine for this race and struggled after qualifying 25th in the session. 41 cars took time as Morgan Shepherd was the lone driver to not make the race.